Last year, global military spending reportedly exceeded $1.7 trillion – more than $4.6 billion a day, which alone is almost twice the UN’s budget for an entire year. The fact above describes that Military-Industrial-Complex (MIC) – especially in U.S. – still rules the world. Global military industrial consumption represents a few percent of GDP and is still rising. U.S. share of the cake is about 40%. The international community still is willing to invest hundreds of times more to the war than peace. MIC is a concept commonly used to refer to policy relationships between governments, national armed forces, and industrial support they obtain from the commercial sector in political approval for research, development, production, use, and support for military training, weapons, equipment, and facilities within the national defense and security policy. Even academia is in tow, with about 350 colleges and universities agreeing to do Pentagon-funded research. In Academic world neuro-weapons and diverse applications of numerous branches of research – such as the software guidance systems, general communications networking systems and robotics technology – that blur the distinctions between government, military, and medical, technological and scientific research. Amid all this waste the Pentagon spares no effort to keep the media on its side, both in the US and elsewhere. The military allocated at least $4.7 billion this year to “influence operations” and has more than 27,000 employees devoted to such activities. War activities are producing high quarterly bonuses for owners of military-industrial-complex. 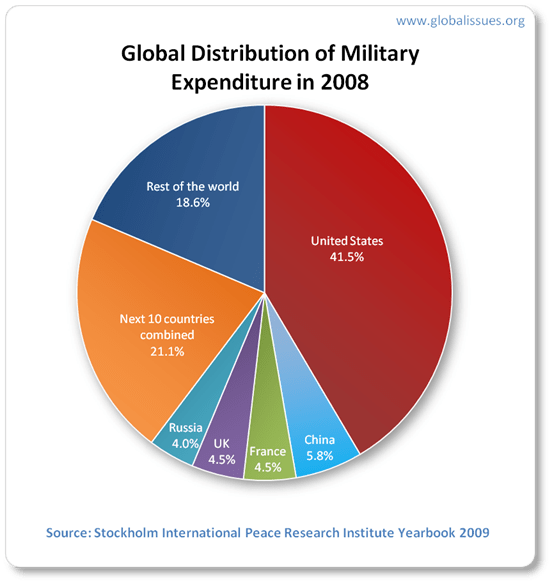 Peace work has an opposite problem – it is not profitable, While global military spending is at least $ 1.7 trillion, the OECD Development tries to manage with some 100 billion, Peace work overall gets some 6 billion and 0.6 billion goes to conflict prevention. Peace Research, could help prevent conflicts, but development of tools for killing is much more lucrative. Against one peace researcher, is estimated to be more than 1100 researcher for weapon (and their use) developers. The difference in what countries are prepared to invest in weapons and their use is huge compared to what they use for example, poverty elimination and economic development in developing countries. And just poverty is one of the causes of violence. In Afghanistan, one gallon oil costs the invading troops $ 400 and annual expenditure of one soldier is almost one million US dollar according to a recent statistics. To keep people happy and silence critics Pentagon spares no effort to keep the media on its side, both in the US and elsewhere. 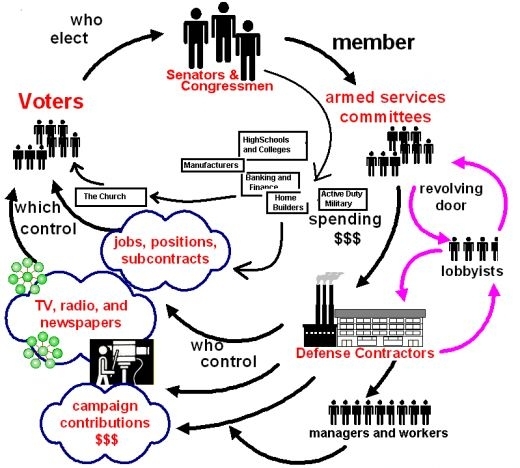 Last years the military allocated at least $4.7 billion per year to “influence operations” and has more than 27,000 employees devoted to such activities. The cost of making a Qassam rocket for attacking to Israel is only $ 10-20/each while protecting Israeli civilians with Iron Dome interceptors costs each time $ 40,000 – 100,000. Peace Research, could help prevent conflicts, but to kill the development of tools is much more lucrative. Against one peace researcher, is estimated to be more than 1100 researcher for weapon (and their use) developers. Every gun that is made, every warship launched, every rocket fired signifies, in the final sense, a theft from those who hunger and are not fed, those who are cold and are not clothed…. We pay for a single destroyer with new homes that could have housed more than 8,000 people…. This is not a way of life at all, in any true sense. This entry was posted on Wednesday, August 29th, 2012 at 11:11 pm and is filed under crisis management. You can follow any responses to this entry through the RSS 2.0 feed. Both comments and pings are currently closed.